Today a new challenge begins at 7 Kids College Fund Challenge Blog, ANYTHING GOES but our design team decided on doing Die Cuts! Here is the card I made using die cuts available at the 7 Kids College Fund Store. I started with 1 piece of Maja Design's Sofiero collection luscious papers and Gold Majesty Circles from Spellbinders. Then I just added a few more dies and I was done! The flowers below were made with Rolled Rose die from LaLa Land and Flower and Leaves Creatable die by Marianne. I put pearls in the middle of the rolled roses. The two pink scrolls on the side of the circle is a die from LaLa Land called Decorative Corners die and it so versatile. I used it here and then made a butterfly with it shown on the bow. Here is the Decorative Corner Die from LaLa Land I made into a butterfly then placed it on top of a tulle bow. Dimension, I just love the papers! I sure hope you get a chance to go visit my other teammates at 7 Kids College Fund Challenge Blog and see their awesome cards. Also, if you enter our challenge you could win the gift certificate to the 7 Kids College Fund Store!! There are so many pre-orders coming in and new items that were never carried there before so I hope you check it all out. Thank you for stopping by today! Wishing you all a very peaceful and fun week! This is such an exquisite and delicate work of art, Kelly! I adore those papers....so gorgeous! 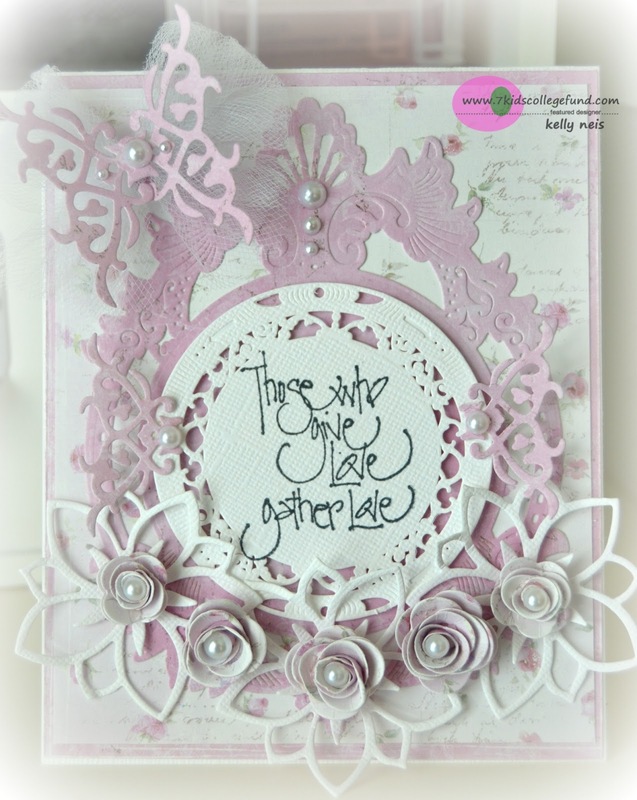 I loved the beautiful die cuts and the rolled roses with the pearl centers are divine!!!! Outstanding job! Just so beautiful with the white and pink and how true is the sentiment. Oh so beautiful ! Love how you made the butterfly ! Papers are wonderful, love them ! White and pink, oh really nice combo ! So very pretty Kelly! Your flowers are gorgeous. How strange - you have a Palliser ad on you blog and we are getting ready to by a sofa and two love seats from them. We have friends who have a sofa and a love seat and I have never sat in anything more comfortable!!! In fact we are going to these friends for dinner tomorrow night and will sit in these sofas again. Once again, you have another beautiful make sugar! Kelly this is fantastic! My goodness all of those dies are gorgeous! All so lovely and your design is great! You've created another outstanding beauty! This is beautiful! 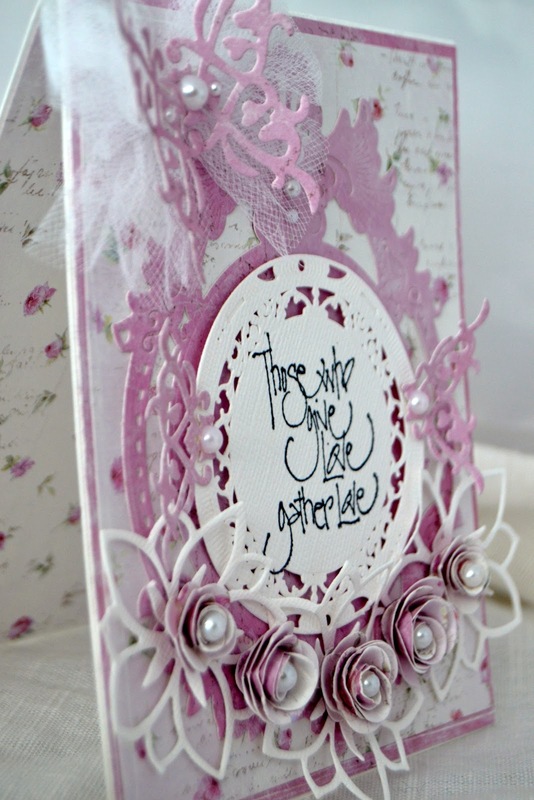 Love all those pretty die cuts and embellies and the sentiment is gorgeous! LOL..I was completely stumped. I kept saying to myself..."Those who give LATE, gather LATE. What the heck? This card is GORGEOUS, but seriously, what does she mean with that sentiment??" Who's a big dummy?? ME! LOL...I finally found my glasses and it all makes sense now. Hahahaha....AWESOME ensemble of die cuts and your gloriously creative touch Kelly! hugs to you and thanks for the morning giggles.... geesh.